The film does illustrate, as most of these recent anime films have, the difference between a family film and a children’s film. It’s a distinction that Hollywood seems to have forgotten. Hollywood has realized that no matter how much parents hate the experience, they are always going to take their kids to the theater and buy their own tickets anyway. A children’s film has no need to entertain anyone over the age of twelve, and therefore makes no effort to (I dread the day the anime industry figures this one out). The recent trend of anime has not been child specific, but child inclusive, and that has kept them from being bland and insipid to my own jaded adult perspective, A Letter to Momo included. The film is about Momo, a girl whose father recently died, and without his income she and her mother move to a new town with some distant relatives who have some space to spare. It’s all a bit much for a little kid to deal with since Momo now has to stay behind, alone and lonely, in a house that isn’t a home while her mother looks for work. And the last time Momo saw her father she had an argument with him, telling him to never come back, so she has an overwhelming sense of guilt to deal with, too. The gimmick of the film is that in her new home, Momo stumbles into three goblins that no one else can see. They start causing mischief, and Momo winds up spending all her time trying to keep them from ruining her life even more. 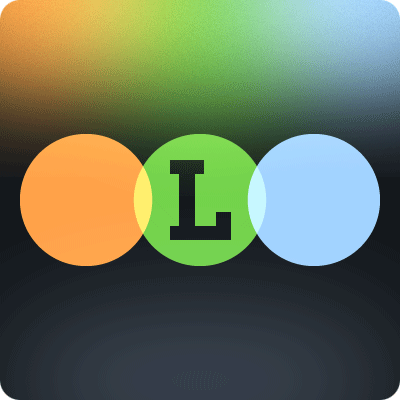 This is certainly not a new concept, and it has a bit of a “been there, done that” feel to it. But every time it looks like it’s going to follow the obvious path, like wallowing in juvenile fart jokes or overdoing the “no one else can see them” gags, it instead turns back to focus on the real point of the story: Momo’s struggles with her emotions and attempting to find a new life in her new home. 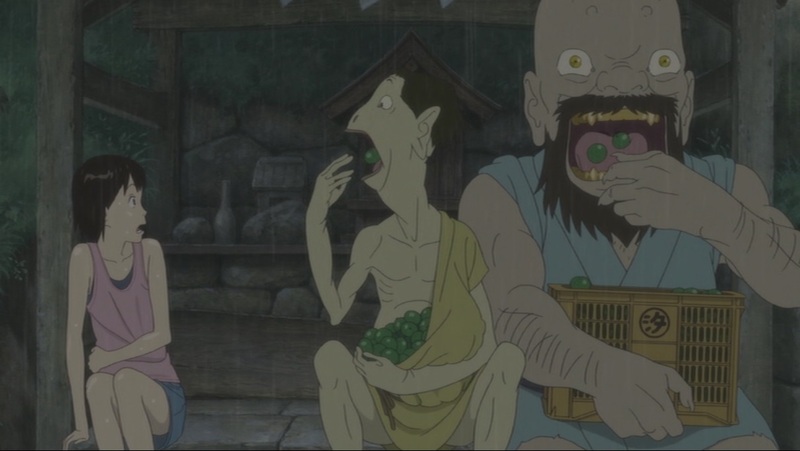 It is entirely possible to see the goblins as symbols of Momo’s negative emotions and her arguments with them as her attempts to cope with her unpleasant situation. Because of this, the film has a lot more depth than the goofy antics would imply. It deals honestly with her emotions and the problems she has with her mother who is trying to move on with her life while Momo can’t. When she isn’t wrangling goblins, Momo spends her days musing over an unfinished letter she found in her father’s desk. It’s addressed to her, but has nothing beyond the opening salutation, a symbol of the lack of closure she has with her father. 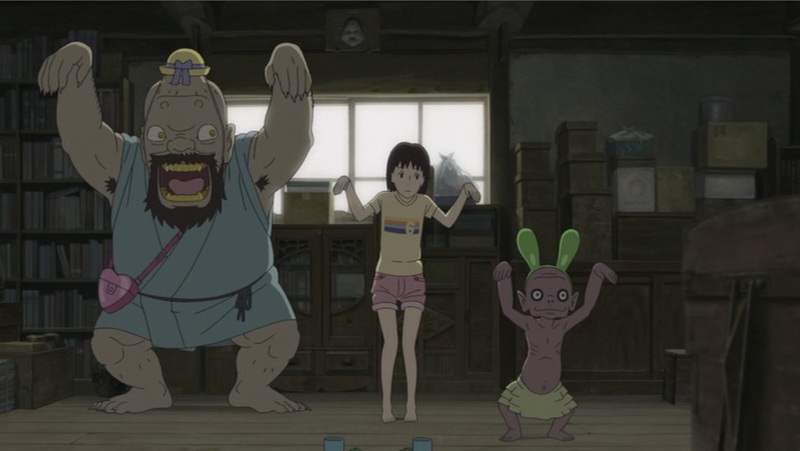 The film is perhaps a little too heavy on the symbols, as it has another big one: Momo is too afraid to dive into the river like the other neighborhood kids do, yet again symbolizing her problems fitting into her new life. The film is about Momo getting over the past and learning from her mistakes so that she won’t make them again. At times it feels a little too heavy-handed in its approach, but it still had enough charm to keep me interested. It’s also a fairly slow-moving film. It’s not action-packed or at all exciting. It builds its tension off of the emotional turmoil of its characters rather than the physical antics of the goblins. Even though it hints that the goblins are the source of a lot of problems, it always presents them as mischievous scamps rather than villains. They serve to lighten the mood and contrast with Momo’s depressed attitude, thus making the film an odd blend of cheerful fun and sad heartbreak. Another of the film’s strengths is its high-quality animation. 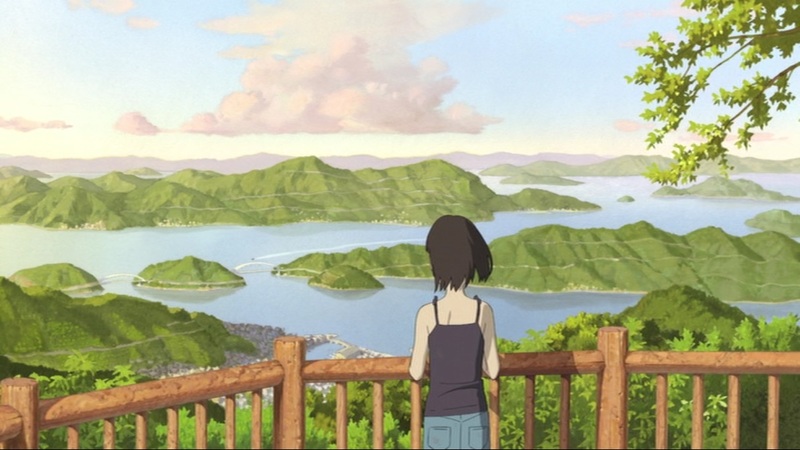 Visually, the film clearly outclasses Mamoru Hosoda’s films, and Momo’s world is a lush and vibrant treat for the eyes. The film rarely uses CG, and even those moments don’t look bad at all. So while A Letter to Momo is often slow and plodding, it also has a lot of good qualities that hold it up. It’s an enjoyable film with a lot of warmth, and it’s certainly worth seeing if you get the chance.